This seven patch quilt block (which I chose to construct as an uneven nine patch block) could be a "sister" to the more commonly used Bear's Paw block because it uses all the same pieces -- they are just laid out with a slight difference. 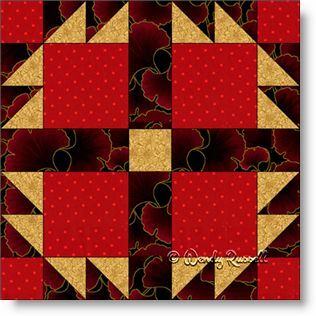 This quilt block can be considered as both an easy or challenging block to make. It all depends on the precision of your seam allowance, since there are many individual pieces. However, none of the components are difficult to make.